Gigha Green Power on the community-owned Isle of Gigha have recently commissioned an Enercon E33 turbine to complement their existing three Vestas V27 wind farm. However, due to grid constraints the output of the turbine is restricted to 225kW rather than its designed 330kW output. Whilst an updated grid connection is in the pipeline for 2015 / 2016, this presents an ideal opportunity to research and prototype an Energy Storage System to release the full potential of the turbine. A consortium led by REDT have been successful in gaining DECC funding for such a project and the battery is due for installation on Gigha in Q1 2015. This innovative solution to an increasingly common problem will allow a behind the meter flow battery to store any excess power and release this power when the wind drops and the capacity on the grid is available. This is the first battery of this type to be installed at this size in a working capacity and will provide valuable insight into the technology and its real world implementation. The community of Gigha will benefit from the additional income received and it is also hoped the the system will be used to research arbitrage models and small scale network support. For update on this project see the Community Energy Scotland website. 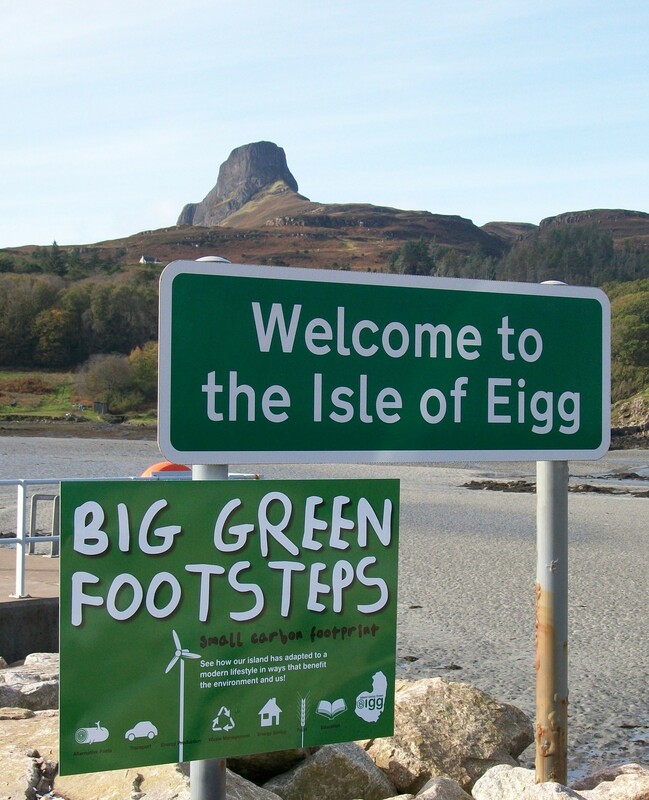 The isle of Eigg was the only Scottish finalist out 10 contestants for the £ 1 million prize offered by NESTA’S Big Green Challenge aimed at reducing a community’s carbon footprint, and one of the 3 winners in 2010. The award-winning Eigg electrification scheme installed in 2008 gave the islanders a good head start. The Eigg Green grid uses wind, water and sun to power the 40 homes and businesses on the island, with diesel as a back up when required. To reduce their carbon footprint further, the islanders of Eigg focussed on cutting down their use of high CO2 emitting fossil fuels, like coal & kerosene (used to heat residents’ homes and water) and diesel (used in the renewable electric grid back-up generators and island vehicles). They did this by installing pilot solar thermal panels systems on three island homes and a community building, providing access to good quality wood fuel as an alternative to coal/kerosene and reducing the use of island vehicles through provision of an all year-round mini-bus run in part on recycled chip-oil whilst encouraging more walking and cycling by providing a green grant for islanders to buy new bicycles. Growing more local food helped reduce food miles whilst reducing the amount of waste going into the skip through recycling, reducing and composting, also helped to reduce Eigg’s methane emissions through landfill. Sharing the knowledge was an important part of the project. To that end, the islanders launched their own Island Going Green website. Thanks to S.I.F. director Frank Corcoran’s inspiring presentation at the European Small Isles Federation (ESIN) AGM in Elba in September 2010, ESIN unanimously decided to adopt the Islands Going Green Scheme, with Sweden and Finland taking the lead. With five years of carbon busting achievements, Fyne Futures’ Towards Zero Carbon Bute was one of the UK entries into the Energy Globe Award. Altogether there were over 1000 entries from 120 countries. 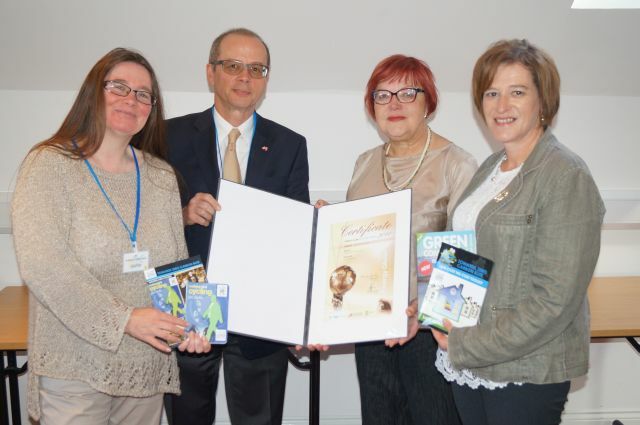 The inspiring TZCB project reduced the islands emissions by 5,274 tonnes of CO2 and was justly rewarded by the National Energy Globe Award United Kingdom. TZCB did this delivered via recycling waste management, reuse of furniture, growing local produce, raising awareness and promoting behaviour change across a number of themes including low carbon travel initiatives, energy efficiency and renewable technologies. Energy Globe also offers citizens a free online check to find out the individual energy saving potential. In addition with the online solar tool citizens have the option to find out how to generate and use solar energy – the tool delivers a country-specific result and takes into account the respective sunlight. The sum of the potential energy savings and the potential of solar power generated are documented continuously online on a global counter. From the end of May sustainable projects can be submitted again for Energy Globe Award 2015. All details and the entry form are available for download on www.energyglobe.info. reducing Household Energy Consumption: In partnership with the Energy Saving Trust we are aiming to start a project to help people reduce energy consumption in their homes. Energy Saving Trust officers will conduct home visits to complete an initial energy audit and offer advice on energy saving measures. They will also highlight schemes which give householders help with the costs of upgrading insulation and heating systems as well as installation of heat pumps and renewables. 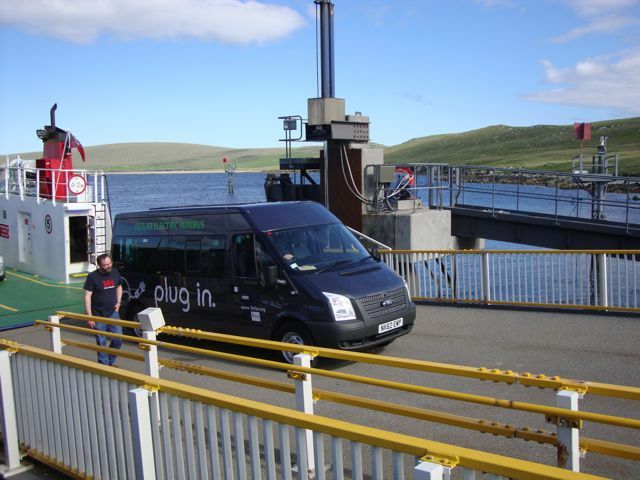 Electric Transport: the Community has secured funding to purchase an electric minibus to be charged by a linked wind turbine. Excess energy would be used to provide heating for the local Primary School and Nursery. This vehicle will provide a much better solution to the transport needs of islanders and replace up to two diesel powered vehicles. Reducing Food Miles: A number of people on the island already grow there own food, but not everyone has suitable space or in some cases any land. The Community is currently looking into a scheme to provide both outdoor and indoor areas for growing. In conjunction with this project it is planned to introduce a community composting scheme to recycle as much food waste as possible. Tells us about your island and how it is going green!